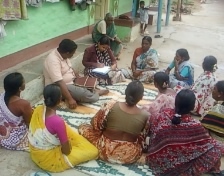 The meeting with SHG held in the month of August and September 2010.The purpose of convening a meeting with them was to discuss about the vocational training being given to the girls in the community centre. While seeking their cooperation. we also convinced them that their daughters should be encouraged to make use of their free time which helps them earn some money.We motivated the women to take steps to encourage their daughters to go for such training being conducted out side the village and spoke to them about women empowerment and how to take responsibility in economic development activity. 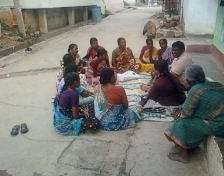 Explained to them about the benefit of group activity and how to utilize the loan facility for developmental activities.